Spring rolled around a couple of weeks ago and that means it's time to reevaluate my skincare routine and adjust it to match my new skincare needs. I'm shedding off my slightly heavier creams/gels and opting for a more watery moisturizer, aka lotions. I've always liked lotions because they are lightweight yet moisturizing enough for the spring and summer time for my skin. Plus, usually, they won't cause my skin to produce excess sebum. This here is the Cosrx Oil-Free Ultra-Moisturizing Lotion (with Birch Sap). Whew what a long name. This is one of Cosrx's newer products and as the name suggests it's a lotion. However, it's not just any lotion, it's a lotion with birch sap! I found this very interesting because this was my first ever birch sap skincare product. Let's get to know it! Product Description: An ultra moisturizing lotion formulated with birch sap. It works to moisturize, soothe, and restore the skin to its natural, healthy state. Birch sap is known for its vitamins and minerals as well as its detoxifying properties. This lotion can help to improve your skin tone and repair damaged skin. To Use: Cleanse and tone the skin first. Take 2 to 3 pumps of the lotion and apply it onto the face evenly. Ingredients: Betula Platyphylla Japonica Juice, Butylene Glycol, Glycerin, Dimethicone, Betaine, Cetearyl Alcohol, 1,2-Hexanediol, Cetearyl Olivate, Sorbitan Olivate, Hydroxyethyl Acrylate/, Sodium Acryloyldimethyl, Taurate Copolymer, Sodium Lactate, Sodium Lactate, Ethylhexylglycerin, Sodium Hyaluronate, Allantoin, Panthenol, Xanthan Gum, Ethyl Hexanediol, Citrus Medica Limonum (Lemon) Peel Oil, Melaleuca Alternifolia (Tea Tree) Leaf Oil. The main ingredient here is obviously the Birch Sap (Betula Platyphylla Japonica Juice). This lotion contains 70% of it which is quite a lot. I want to point out that this lotion also contains Lemon Oil and Tea Tree Oil. As I recall, the name of this product is Cosrx Oil-Free Ultra-Moisturizing Lotion. So, it's a bit misleading because the product clearly contains oil. 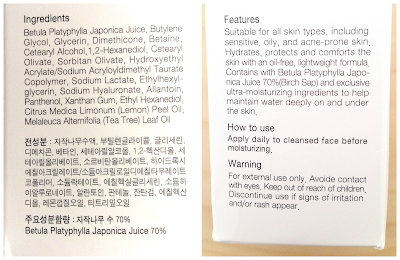 Since the 2 oil ingredients are at the end of the list, I'm guessing there's really not much of either in this product. I'm not saying this is a bad lotion because the name doesn't match the ingredient list, it's just a bit misleading. Packaging: All Cosrx products have this simple and sleek packaging style. This Cosrx Oil-Free Ultra-Moisturizing Lotion is no different. 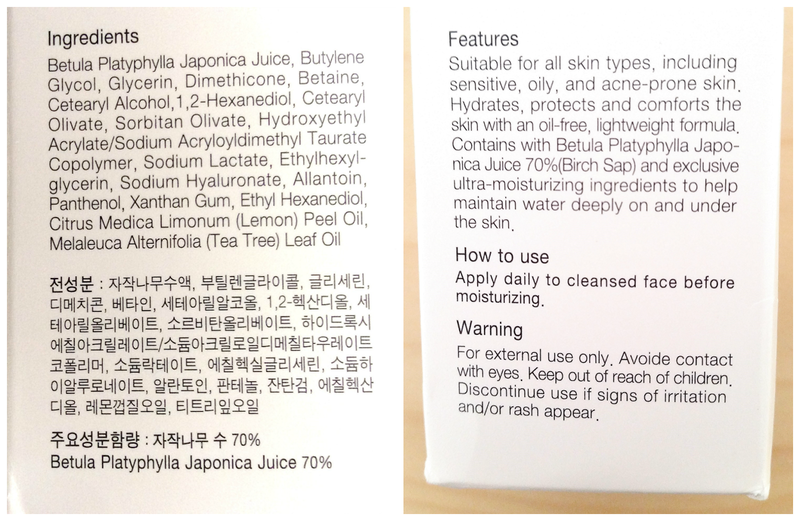 The outer box packaging has a lot of information in both Korean and English, which includes the ingredients, how to use, features, and more. The lotion itself is stored in a tall plastic bottle with a pump. The lotion is good for 12 months after opening. Manufacturing and expiration dates can be found on the bottom of the bottle. Scent: I like the scent of this lotion. It smells fresh and forest-like. It just smells green you know. I imagine it's due to the birch sap. The scent is rather light and disappears quickly after application. 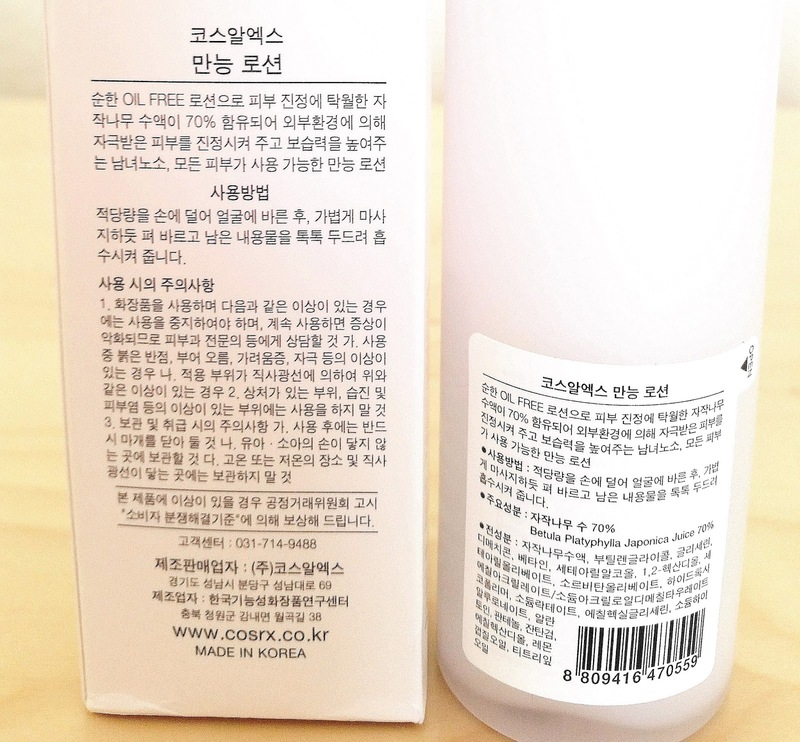 Color: The lotion is milky white in color. 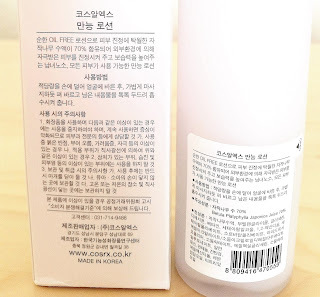 Texture: I thought the texture of this lotion to be similar to Innisfree's lotions but it seems like it's not as runny. This Cosrx Oil-Free Ultra-Moisturizing Lotion feels silky and lightweight. It's hydrating and spreads easily. Ingredients, features, directions, and warning. Michelle's Thoughts: I've been using this lotion mornings and nights for almost a month now and it has worked well so far. I usually only use this as the moisturizing step in the morning and add a sleeping pack after it in the evenings. I've been using this after my Innisfree Green Tea Balancing Skin and the 2 pairs really well together. In fact, the Cosrx Oil-Free Ultra-Moisturizing Lotion works well with pretty much all of my skincare products, which is nice. Usually, I use about 2 to 3 pumps of the lotion to cover my face and neck, plus 2 more pumps for my chest. The lotion spreads easily and absorbs fast as well. I patch tested this product cautiously because I don't think I've ever used any skincare products with birch sap in it, so I didn't know how my skin would react to it. However, patch testing came back clear, so yay! 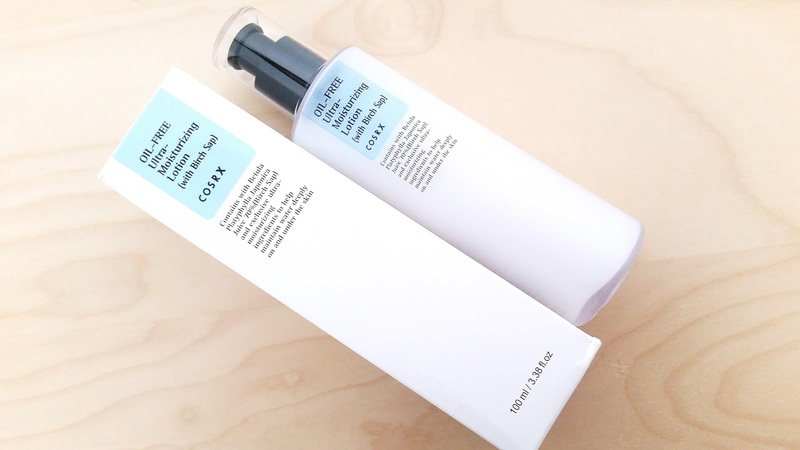 The Cosrx Oil-Free Ultra-Moisturizing Lotion does a great job moisturizing my skin (I have combo to oily skin type) and it keeps it hydrated throughout the day. I do use mists once on some days, but for the most part I've been able to last without it. I haven't noticed much improvements in terms of the lotion repairing damaged skin as claimed. However, this has been a great daily moisturizer for me. The lotion is also very gentle on my skin and doesn't irritate my sensitive skin. It also feels soothing when applied. 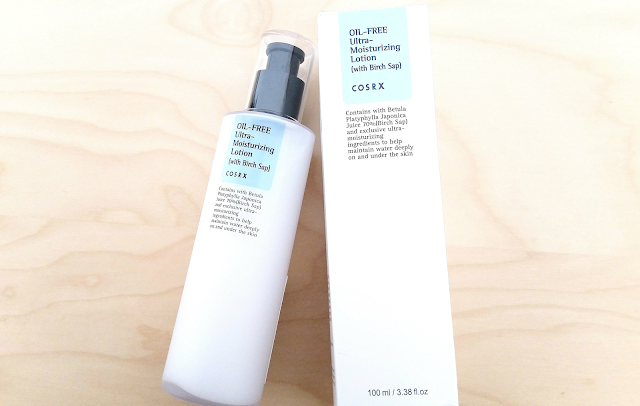 Final Thoughts: I like this Cosrx Oil-Free Ultra-Moisturizing Lotion (with Birch Sap). I think it's a great daily moisturizer for those with combo to oily, normal to oily, or dehydrated oily skin types. The moisturizing properties might not be enough for those with drier skin types though. I like how lightweight and soothing this lotion feels when applied, it's great for my sensitive skin. The lotion is also very hydrating and my skin just drinks it up. Would I purchase it in the future? Maybe. If I don't find anything better, I will probably come back to this lotion. Do I think this is worth a try? I think so. If you are looking for a lightweight moisturizer for daily use, this Cosrx Oil-Free Ultra-Moisturizing Lotion (with Birch Sap) is a great option. It's inexpensive and gender neutral, so everyone can use it. Disclaimer: This product was sent to me for editorial consideration. All opinions are honest and my own. This post contains some affiliate links, for more information check out the full disclaimer.